FLOYD COUNTY, Ind. (WHAS11) – Officials in Floyd County are investigating an accident where a truck was hanging above a creek bed Sunday. The Lafayette Township Fire District was sent to Scottsville Road just before 7 a.m.
Officials say the truck had been traveling north on Scottsville Road from Paoli Pike. They say the truck drifted off the roadway, onto a guardrail and slammed into a concrete bridge support. 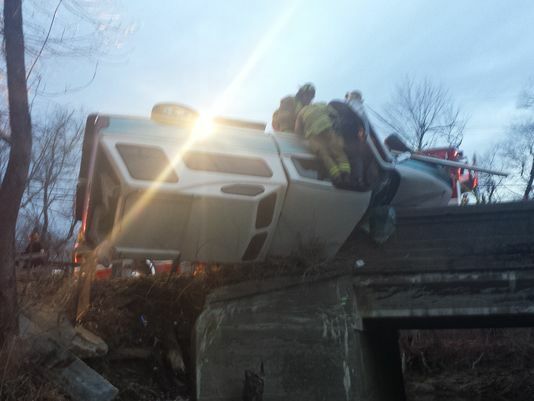 Crews say the truck was hanging over the creek which was 15-feet below. They say it took them an hour to get the driver out of the vehicle. The driver did not sustain any injuries but was taken to the hospital as a precaution. The Floyd County Sheriff’s Department is investigating whether the driver was under the influence.